What a discovery this valley has turned out to be. A chance viewing of a documentary on the history of Absinthe inspired me to voyage here to its terre de naissance. Yes, the Green Fairy, so lauded by Parisian bohemians and bourgeoisie alike at the turn of the 19th C is not French, nor Eastern European, but in fact Swiss. Who’d have thought it. I certainly not, so I came to investigate and fell instantly in love with the Val de Travers. The scenery is stunning. There are very few tourists (no major airports anywhere nearby) and perhaps the draw of more well known Swiss destinations helps too. The people are delightful. 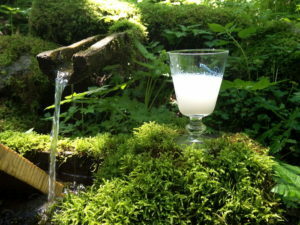 The forests are inhabited by fairies who stash bottles of absinthe in forested fountain caches for you to seek out, travel in the Valley is free thanks to a card issued by every accommodation. I came to chase the green fairy and to write about doing so, but almost now hope not to find her too soon so I will need to extend my stay. Maison d’Hôte Jurabelle – Bellevue 8 CH-2117 La Côte-aux-Fées. Goodness this place is wonderful. It is truly a long time since I have stayed anywhere like this. 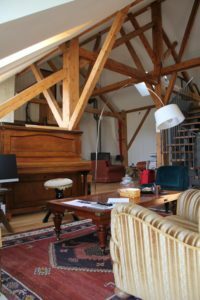 An 18th C farm lovingly converted as recently as 2014, Othmar Marbacher has carved out his own corner in this green paradise. The wooden modern chalet style building together with Othmars’ hospitality instantly makes you feel at home. It sleeps 24 so there is room aplenty. I love how you can see details of each room online and as you make the restoration, select your room name at the same time. This location in the heart of the Côte-aux-Fées – the heartland of fairies – is perfect for spotting the little green fellas. Look online and book ahead. Maison d’hôte Jurabelle. If you are reading this, you’ll already know about Absinthe and you have probably also discovered it was born here in this very enchanted valley more than two centuries ago. If this is the current extent of your knowledge – as it was mine before I ventured here, strap yourself in, for you are in for a veritable voyage of discovery. As you uncover the history of this incredible beverage, it is a journey that will take you through murders, bible bashers, jealous wine makers, propaganda, liquid fuelled geniuses all thanks to a unique a dialogue between all the elements of nature that make up the Val de Travers. And of course, you’ll want to taste the Green Fairy… Correct? I stumbled across this wonderful distillery due to a combination of it being the first Absinthe I was served in this valley and my love of cats. It’s now a second generation distillery, but the founder, very active through the ‘clandestine’ years, Willy Bovet, born and bred in Môtiers is still very much involved. His recipes – secret as befits such a drink – date as far back as 1911. And in fact I particularly enjoyed tasting their Absinthe Tradition, which is as close to the taste of the Absinthe popular during the Belle Epoque as you are likely to find. In addition they are delightful, take the time to explain and show you around. 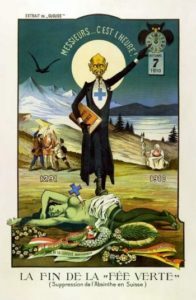 Of course their classic Absinthe le Chat is a vintage poster lovers delight and tastes pretty damn good to boot. You will learn a great deal and enjoy a visit here immensely. See their website for details; Absinthe Bovet. Maison de l’Absinthe – Grande Rue 10, 2112 Métiers NE. Wow, now this is how to run a museum (save for maybe a few more displays in English). I would wholeheartedly recommend starting your journey into Absinthe here and in doing so going for the combined ticket and 3 drinks option. 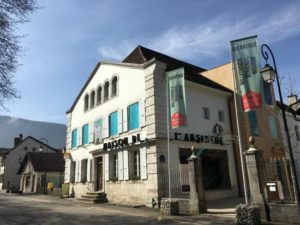 Located in the former police station, next to the yard where all the confiscated stills were stored prior to being shipped off to Bern for destruction, there is a wonderful irony in tasting right on what was the site of the prison created especially for the ‘moonshiners’. Allow a good 90 mins. 45 or so for the museum and the same again to taste and learn about the drink. If you are lucky Oxana will be on duty who is a multi lingual fountain of knowledge about the Green – or not so green – fairy. Check their website here; Maison de l’Absinthe. FREE Transport Card. Now isn’t this a clever idea? 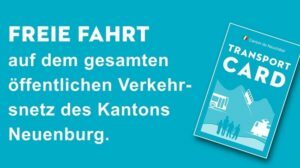 The canton of NEUCHÂTEL has created a travel free card available for all tourists who check into accommodation in the canton. Flippin’ brilliant I reckon. And of course the Swiss trains and the countryside they drive through, are wonderful… More details here. Free Transport Card.